This is the Shopping Post I promised! It's that crazy family bike. I tell you, I can't get over it. It's so clever. 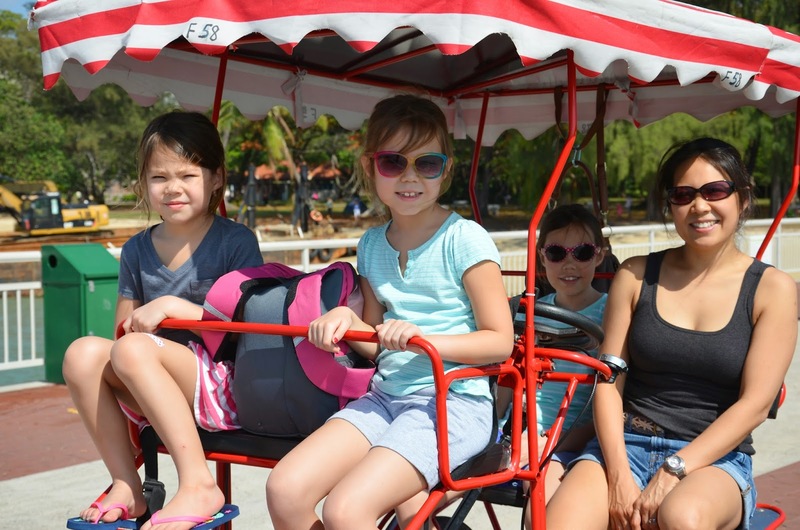 And it's been a huge gift to our family the past couple of years since we've discovered it because it meant that, instead of walking in the sweltering heat, we could all sit in it and pedal our way to whichever part of the beach we wanted to go. Those of you with multiple small(ish) children will understand how valuable this is. Yes, you can slather on sunscreen and train your children to hike and trek and plod through wildernesses and The Grand Canyon and who knows where else, but add scorching temperatures in near-100% humidity to that and it brings a whole new meaning to the expression "Are we there yet?". This bike has saved us. You can rent it at the beach by the hour, and it comes in two sizes: Nuclear Family (seats 5, below) and Extended Clan (seats 7, above). Pedal when you want, stop and get off to take photos when you want, sit in the portable shade when you want. 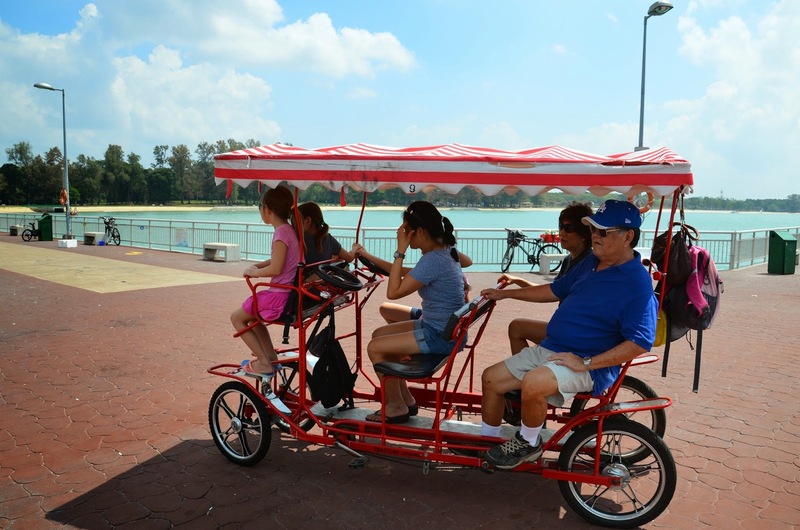 It's like a minivan without walls, and you generate your own sea breeze as you go. Green all round. 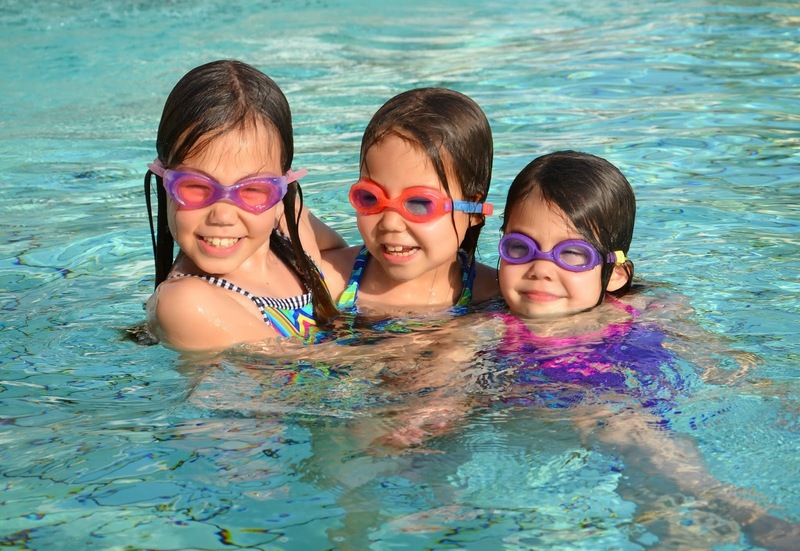 Also, I forgot to mention in the earlier post that the girls have a new favorite activity. 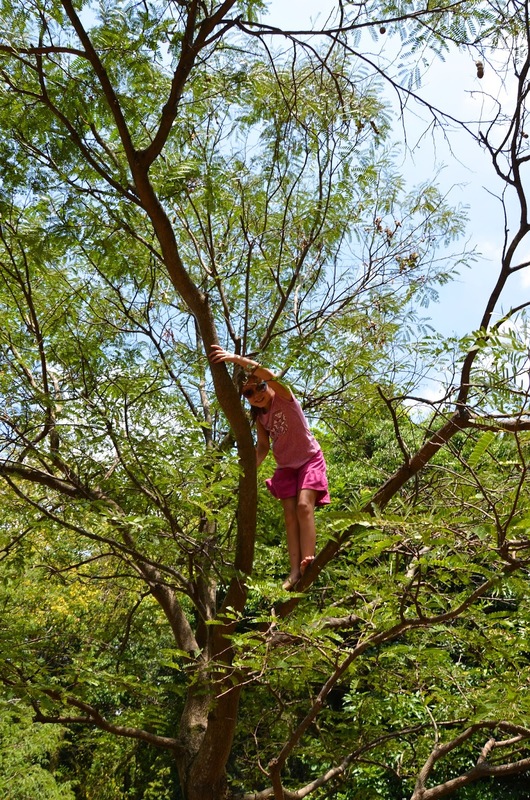 It started when they saw me shin up a tamarind tree to pick a pod for Grandpa to sample. 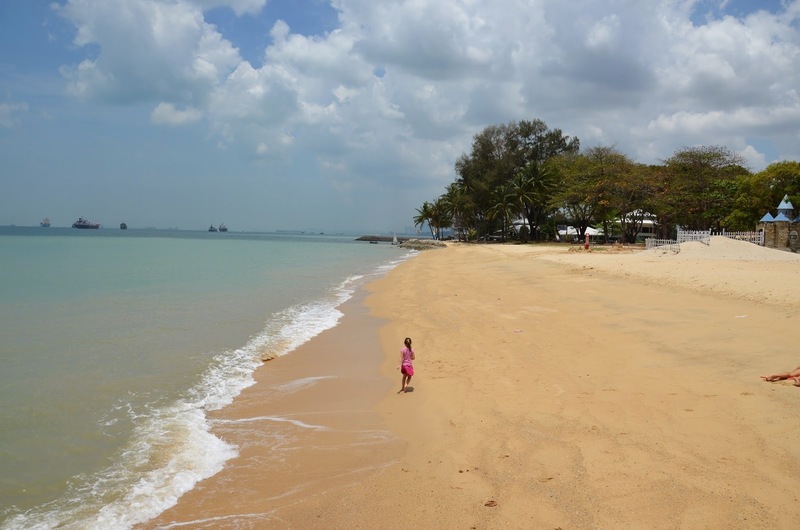 I mentioned in this post that my childhood was full of this sort of stuff - tree climbing, hiking through great unknown backyard forests and discovering Singaporean wildlife. None of the pink Barbie and Princess nonsense alternative existence that seems to be the rage everywhere these days. So yes, I am quite at home in a tree, and sometimes, when we are at the Minnesota apple orchards in the fall, I have been known to climb a tree or two to reach the non-storm-damaged pickings on higher branches. Now, because this is second nature to me, I keep forgetting that it looks very exciting to the three little girls (they're the Barbie and Princess people) watching below. Because all they usually climb are the manmade climbing walls and jungle gyms and whatnot, which (they claim) are tame and predictable by comparison. 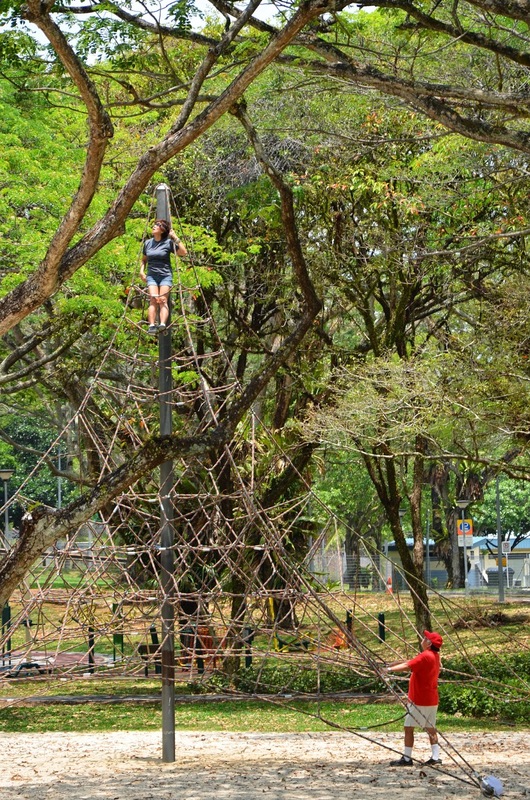 So of course they wanted to climb and conquer the Singapore trees. So they did. 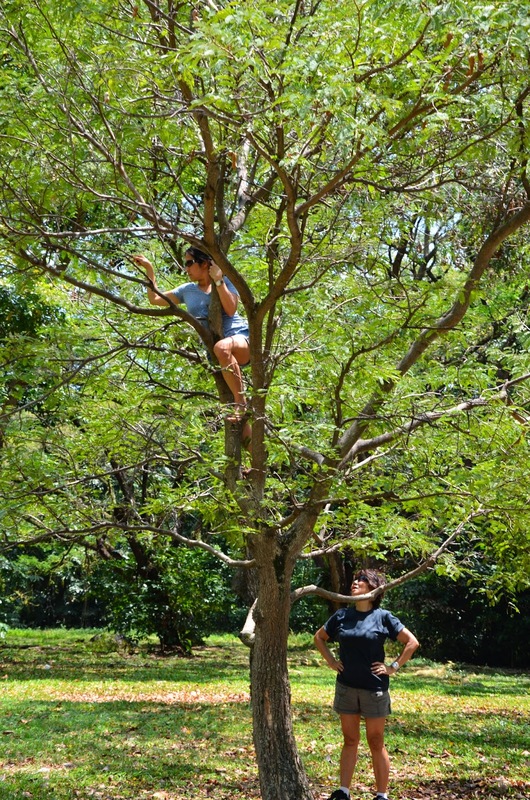 And, thereafter, each time we were at a park, they looked for Good Climbing Trees. Good for them. That's Mum. Not quite a tree, but still. She must have not gotten the memo about Grandmas slowing down in their golden years and, say, sitting placidly and knitting. Good for her. before we head to more urban haunts. that we bought in bulk so the girls could give one to each of their classmates when they presented their I Went To Singapore country reports in school. 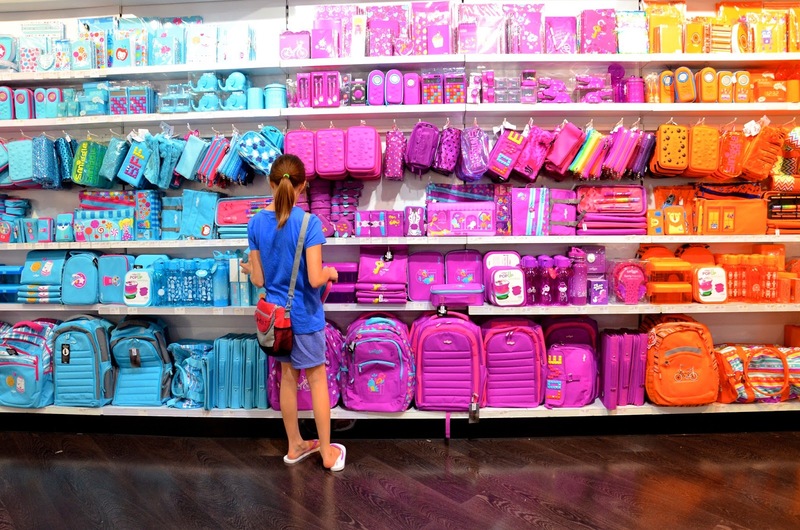 By far, the girls' favorite shops were the stationery stores. 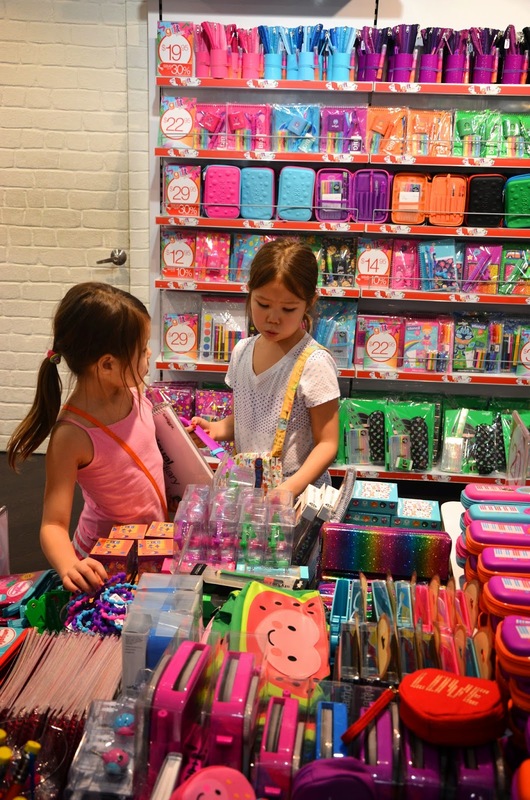 We'd explained to them that the modern toys in the US were of much better quality than the regionally-made ones, and more reasonably priced than the imports. 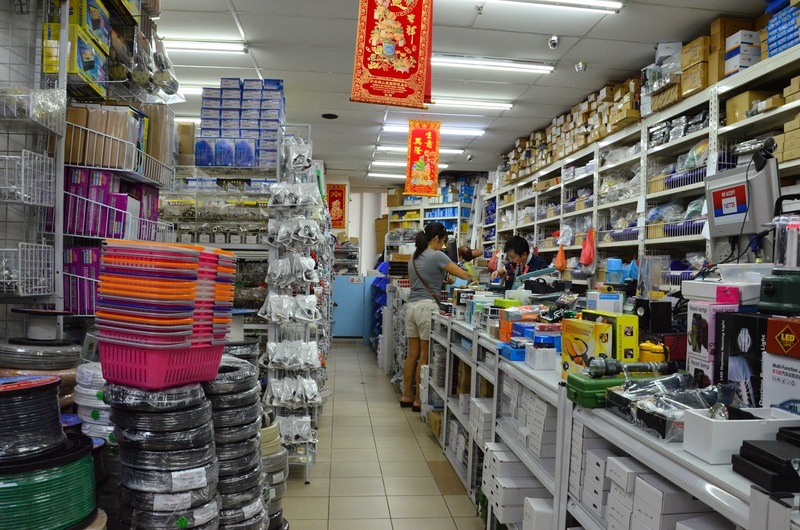 The stationery selection and quality in Singapore, though, are unparalleled, largely because there are so many charming and ingenious independent retailers (as opposed to the megalomonopoly that is Crayola in the US) from different corners of the Commonwealth. 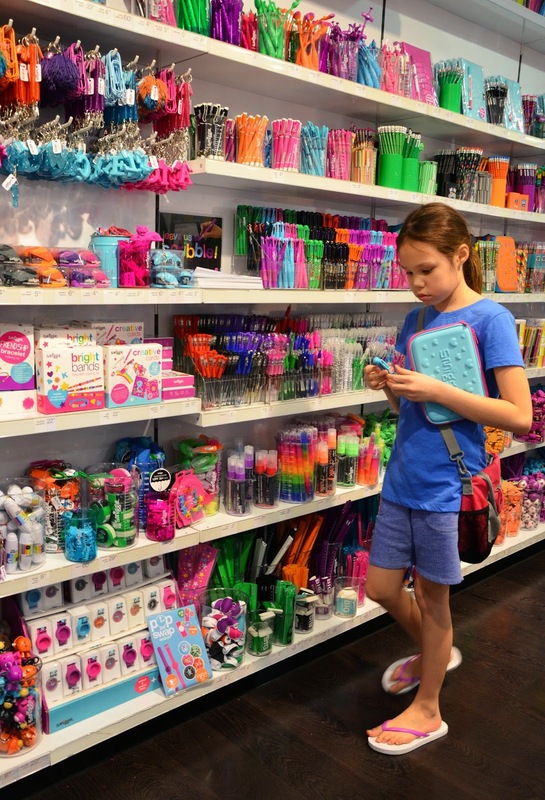 Here are the girls in Smiggle, the color-coordinated stationery heaven that originated in Australia. We wanted to buy everything here. In several colors. And now mine. Actually, I didn't do a lot of sewing-related shopping on this trip -the two metres of ikat in that earlier photo were my only fabric purchase. And Emily and I took a train to the Textile Centre (that's the bulk notions and hardware place) for just a couple rolls of trim and some snap hooks. There's only that much mad sewing a person can do in the eleven months before the next trip to Singapore, right? Summary: not a lot of buying. Browsing, though, was another story. So, the husband and I went on a walking date. The destination was lunch at one of our favorite curry restaurants. 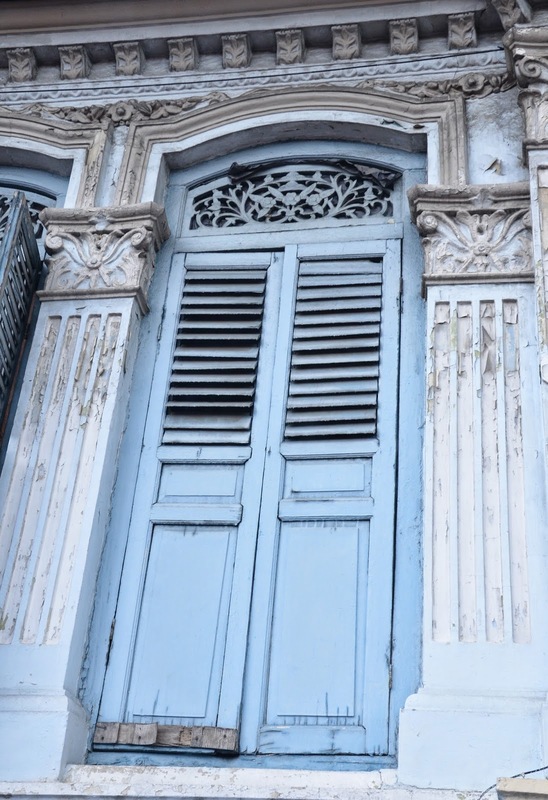 Old shuttered windows on the upper storey of traditional shophouses, very common in the heartland neighborhoods of Singapore. a nice change from the modern steel, glass and neon malls in the heart of the city shopping district. 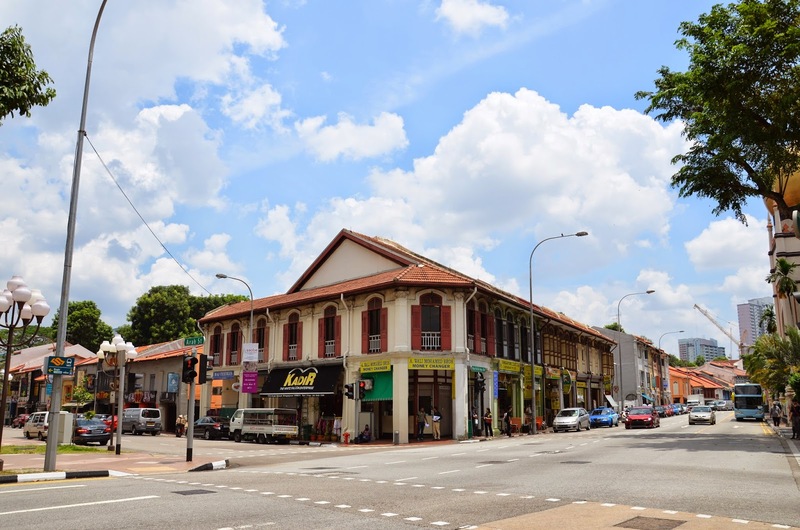 flanked by quaint old shophouses on either side. 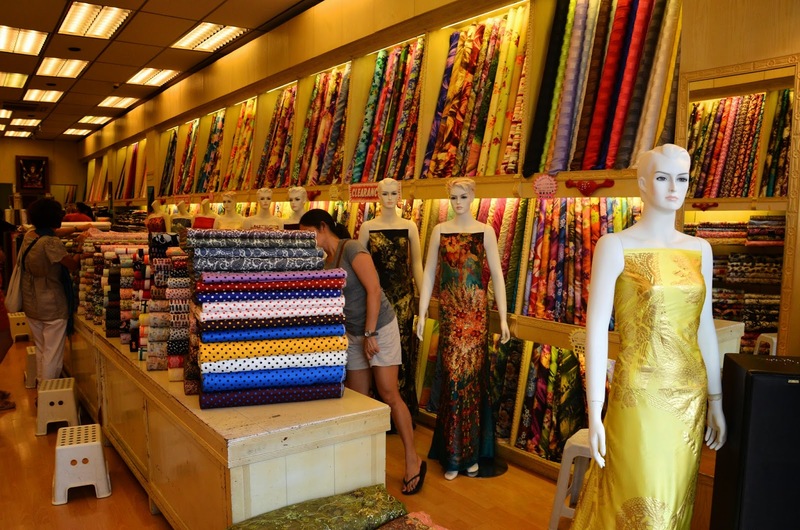 Back when I was a teenager, I'd come here with Mum to shop for special-occasion fabrics - lace, satin, batik, silk embroidery thread, trim and tassels, stuff like that. 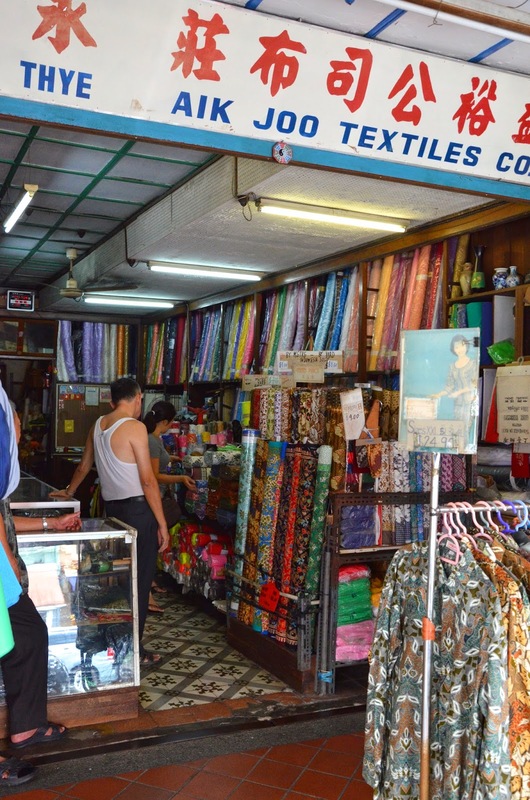 We had other fabric places to go for regular, everyday craft and apparel supplies; Arab Street was the place for the rich, shiny, fancy, embellished material that became prom dresses and wedding gowns. 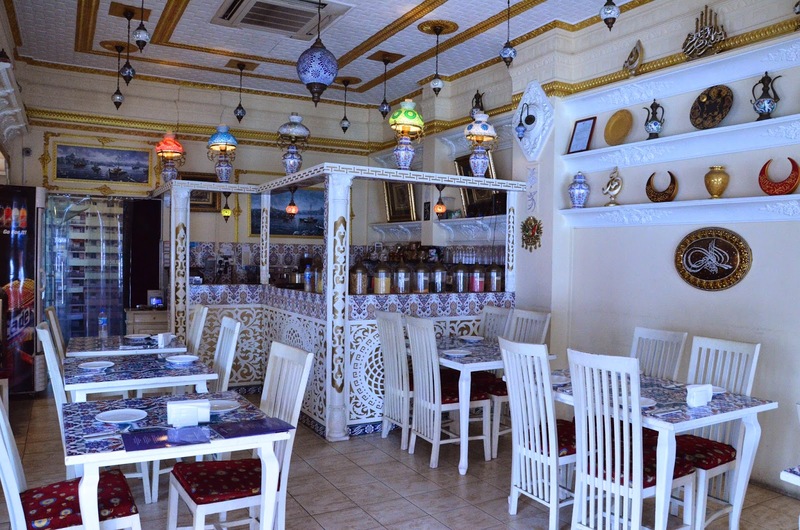 It was also a tourist spot - and the tourists would turn up to mingle with the locals, their cameras around their necks, fanning themselves with folded maps, all prepared to haggle over batiks and baskets and Persian rugs. So much fun to watch. 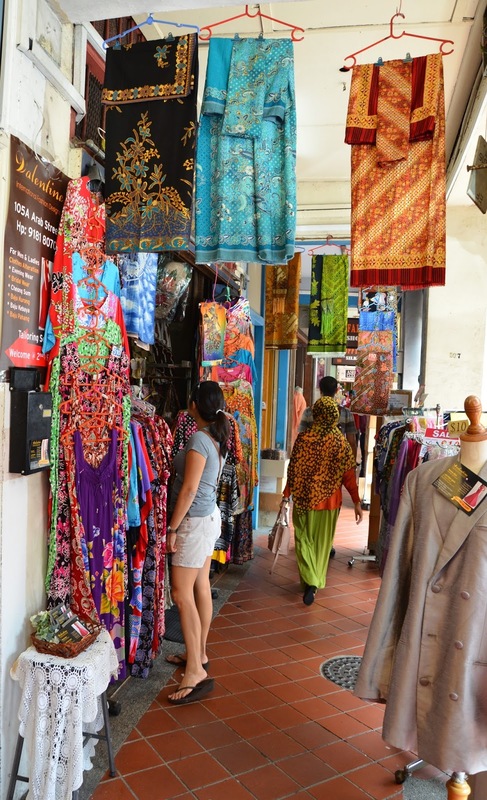 I hadn't been to Arab Street in about a decade, because that's how long I haven't needed to make anyone a fancy gown or bridesmaid dress. So this year, I decided to revisit it. but there were now also quilting cottons (lots of dots but no stripes - why?) among the bolts of apparel fabrics showcased in renovated displays. Whoa. RTW garments - both mass-produced and custom-tailored. And accessories of all kinds - for the home and body - scarves and skirts and coasters and rugs and table linen and cushion covers and kerchiefs and coin purses and bags. Check out the three sarong kebayas over my right shoulder! 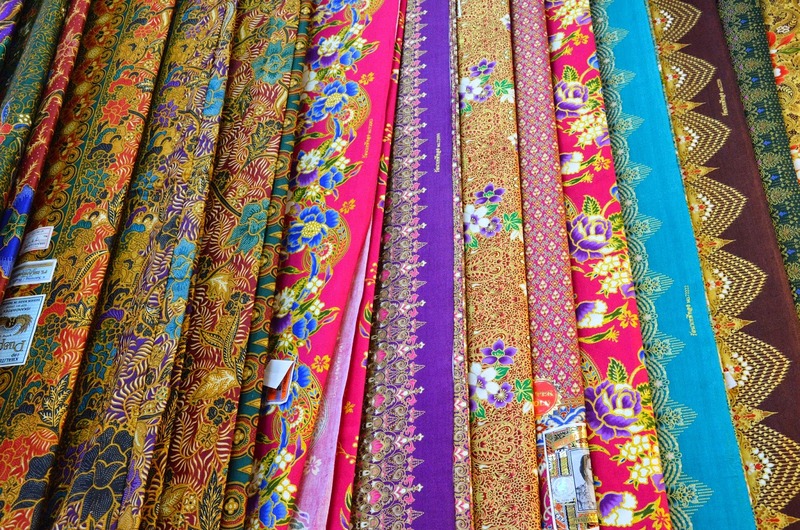 (They're the full suits of sarong skirt and embroidered blouse) They still don't make them manual-embroidery-style and with the wing-needle heirloom seams like they did back in the day, but these modern electronic-machine versions are still gorgeous (and pricey). Ah... a shop selling ikat. They're in the rightmost display column below. That's not real ikat, by the way. It's just block print on regular cotton, not the authentic tie-dyed woven-threads ikat. 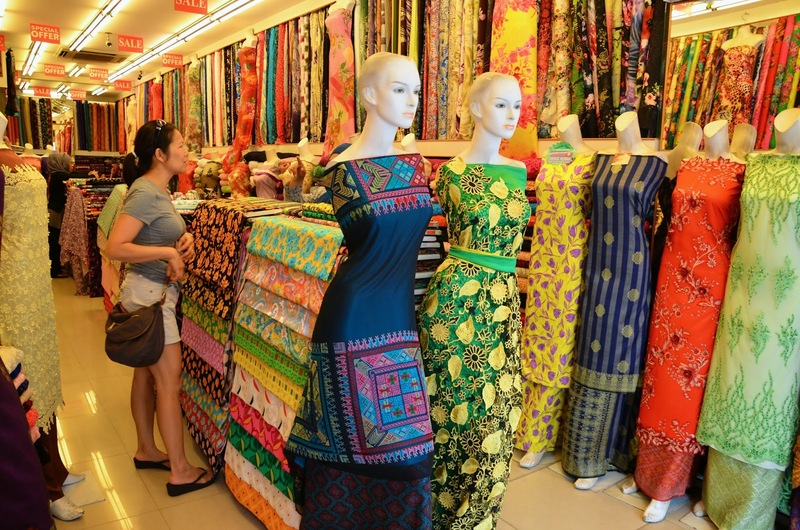 There's me with the salesperson, who'd taken me to the back of the shop to look at "real ikat for only S$45 per meter". There are many kinds of ikat, but this turned out to be so much more silk brocade than the weave pattern I love that I passed and bought the faux print stuff instead. 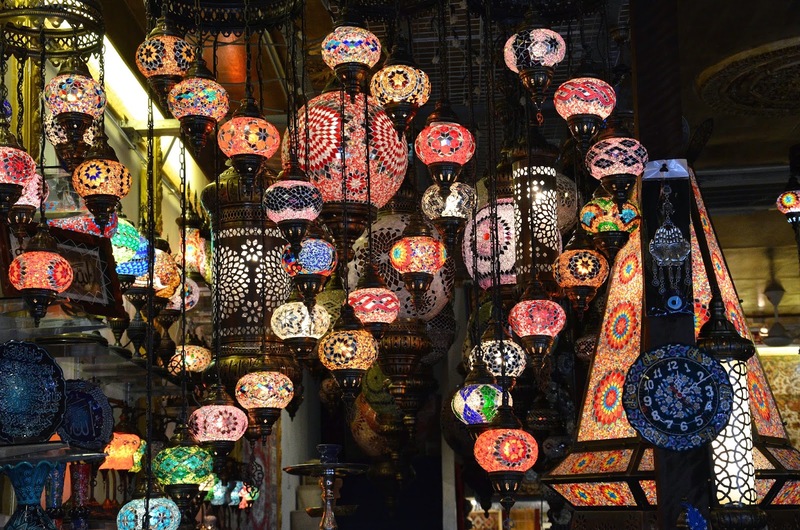 A shop selling lanterns and light fixtures. Here's one of the few shops that still look like they did 20 years ago, complete with fluorescent tube lights and rolls of fabric in glass cases. And the no-longer-ubiquitous Chinese proprietor in his white singlet. 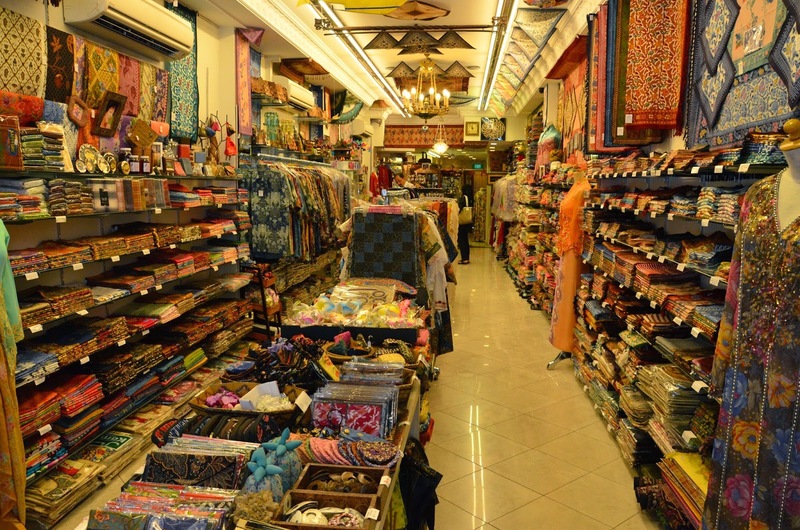 We conversed in Chinese, because that's the right thing to do in a shop like this, and discussed yardage and width, and particular differences in the designs of the batik. I felt like a teenager again, speaking the language of (as I called it) Old Sewing. 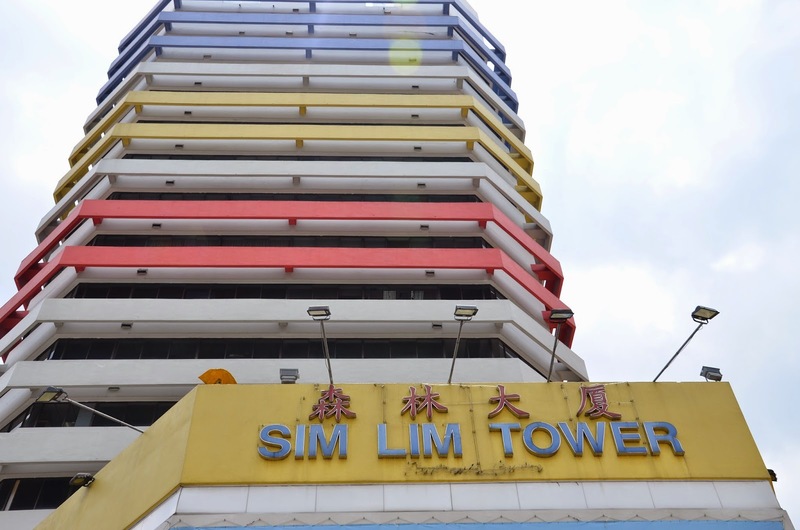 Sim Lim Tower, the home of dozens and dozens of stores selling electronic bits and bobs (and entire computers also). Like Radioshack but in bulk, loads cheaper and organized in ways so mysterious, only the counter staff know how to find anything. Again, I hadn't been here in about a decade. 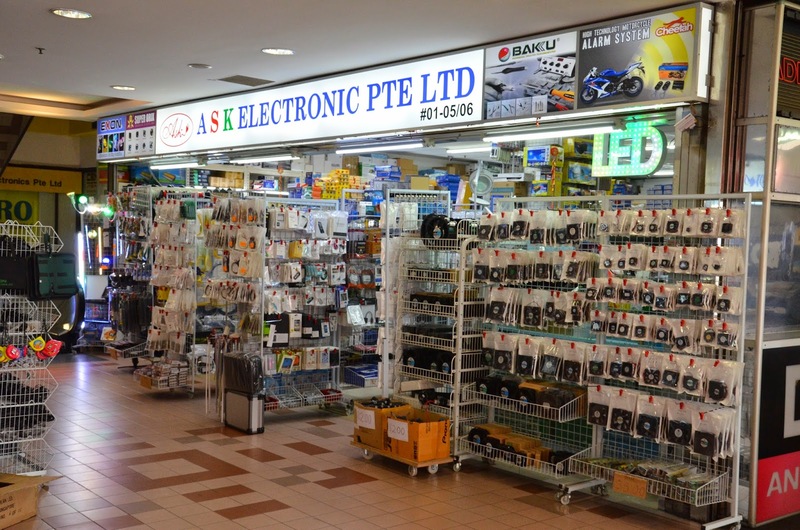 Years before even that, when I was in college, I might have had to come here for the electronic components I needed for my final year project (a pre-amp). Or maybe my lab partner did the shopping and I just drew the graphs. I honestly don't remember - I mean, Physics is lovely and all, but not as lovely as fabric, of which I have much more vivid and inspiring memories. and amassed supplies for the kids. See- there I am consulting (in English and Chinese - soooooo nightmarish) the staff on DC motors and battery holders. So much better to buy components bulk(ish) than as the rather limiting and horrifically overpriced kits you'd find in educational resource stores here in the US. Just the other day, for instance, I was at one of those such stores and saw a kit that taught you how to make a bulb light up. Didn't know whether to laugh or weep. 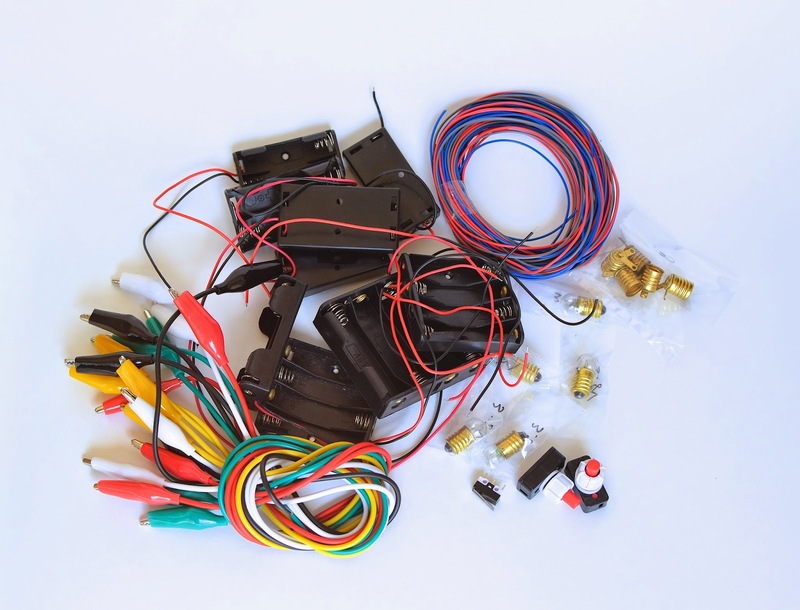 So I bought battery holders, alligator clips, connecting wire by the metre, 3.8 V bulbs, bulb holders and some random switches. These were not my favorite switches (harder for kids to connect) but they were out of knife switches (which I like because they are extremely visual in how they work) and these were all they had. I also wanted to get some lower-revolution DC motors so that our projects wouldn't be limited to just spinning fans and propellers and suchlike. I suppose I must eventually find out where to buy those little plastic gears to get them to rotate more slowly, so that the kids and I can make more exciting things like carousels and revolving toys. Also - I couldn't resist - I bought a circuitry kit to make a doorbell. So inexpensive - it's only about US$4. This one requires soldering, but we have a breadboard at home which the girls can use instead to play with. Jenna, I think, will especially like decoding the resistors because they're colorful and rainbow and striped (all of which she loves). 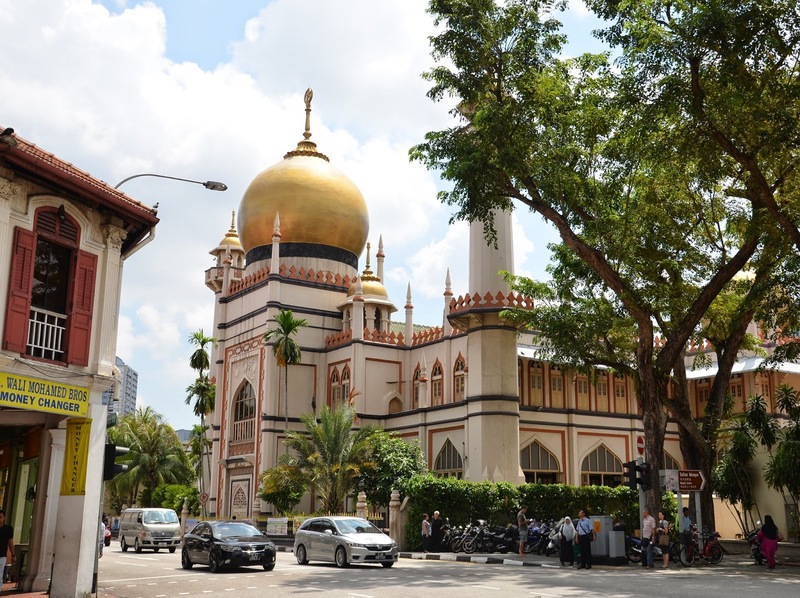 and watching the personality of the streets change from Malay to Chinese to Indian (Little India) in just minutes along the journey. 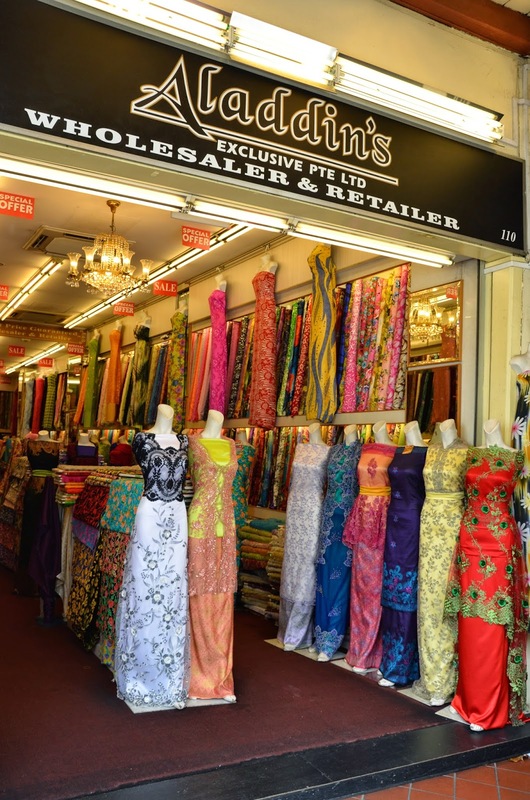 Incidentally, Little India is the place to come for saree silks and tailors for custom-fit saree tops (what are they called? I forget). 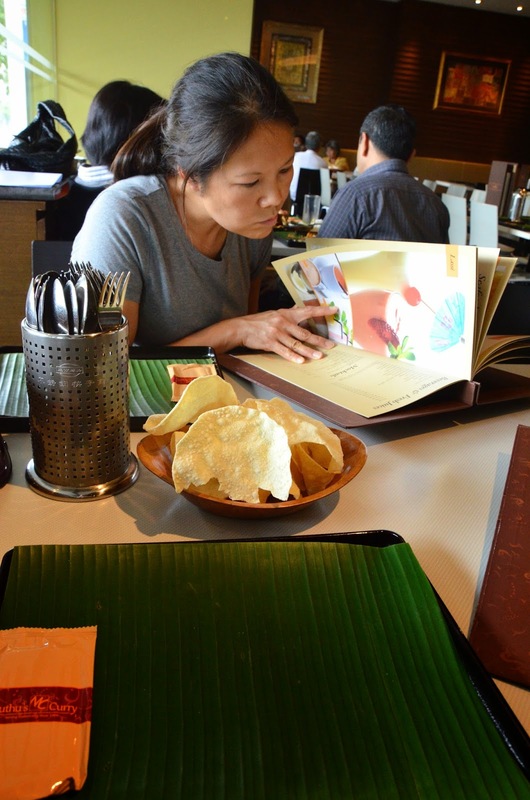 Papadums and real banana leaf plate liners! And food! 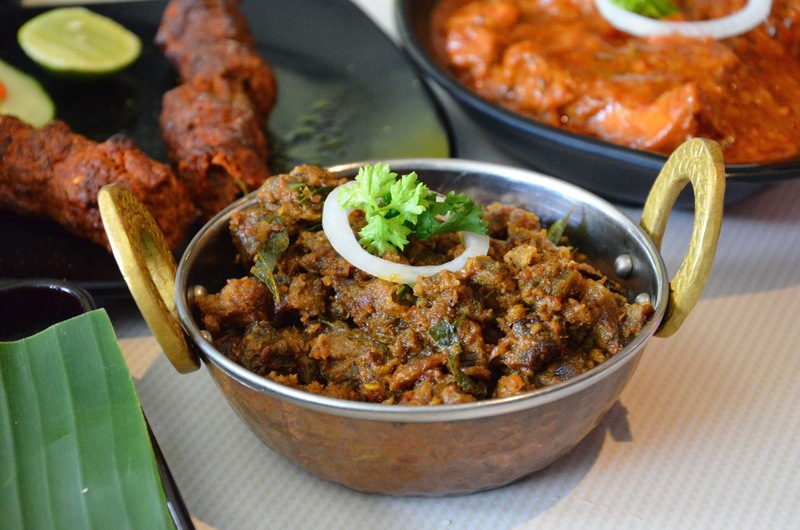 Mutton and rice and kebabs and chicken and lime juice and all things good. Sunshine, ikat, electronics and curry. All dates should be like this, no? Neoprene - various stores in industrial estates; email me. 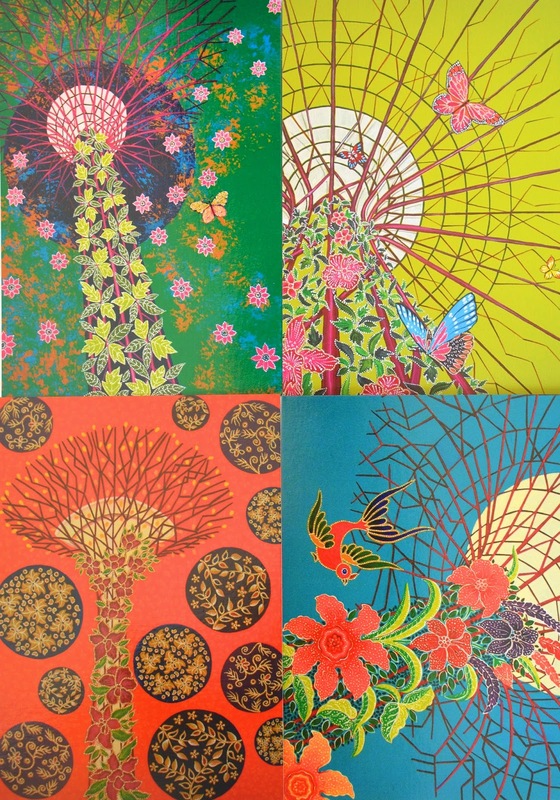 Thanks for this lovely and colourful tour! 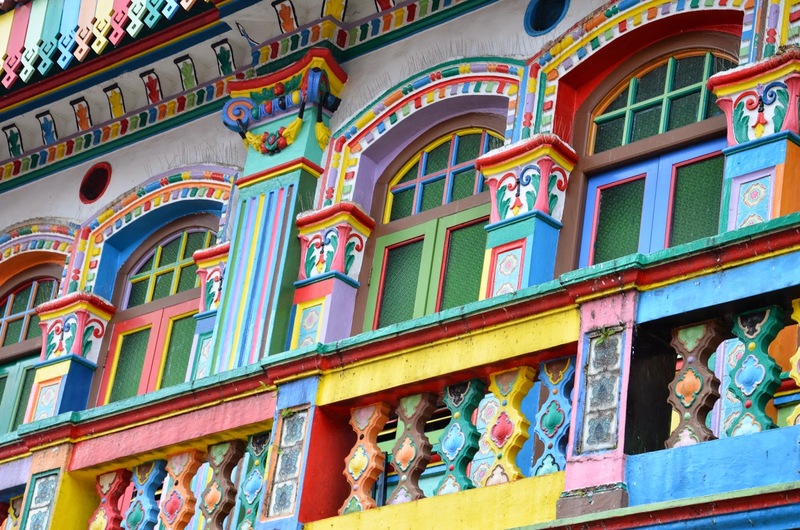 I really needed it as it is supposed to snow here (Alberta) this weekend… Why can't buildings here be so colourful? That was a fun visit! Thanks for taking us along. 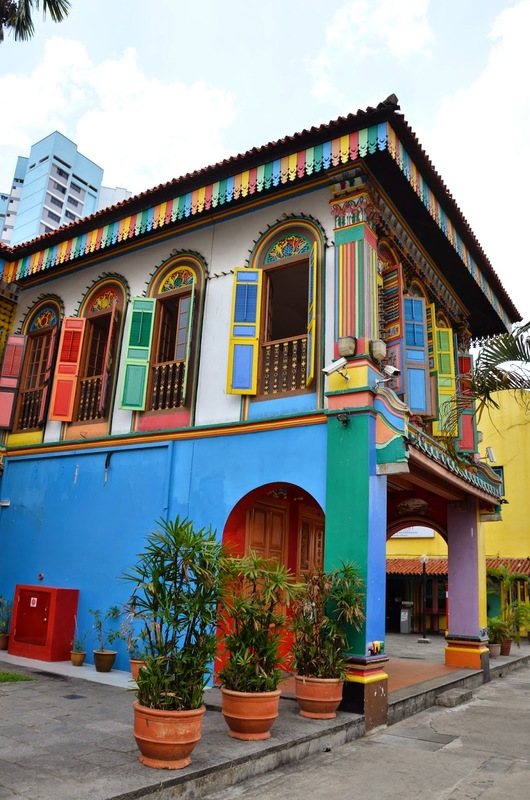 I particularly loved the colorful buildings - wow! Thanks, i'm in Singapore, the 29th(lucky me). Last time I only had time to visit spotlight, now I think that I have to go to Arabstreet again. It looks very nice. Thanks so much for your suggestion. I didn't know there was a textile centre. I normally go to Chinatown. It is not very big, but they have Nice things. I hope you had a lovely holiday! Thank you for such a lovely post and great pictures. Again, great memories. 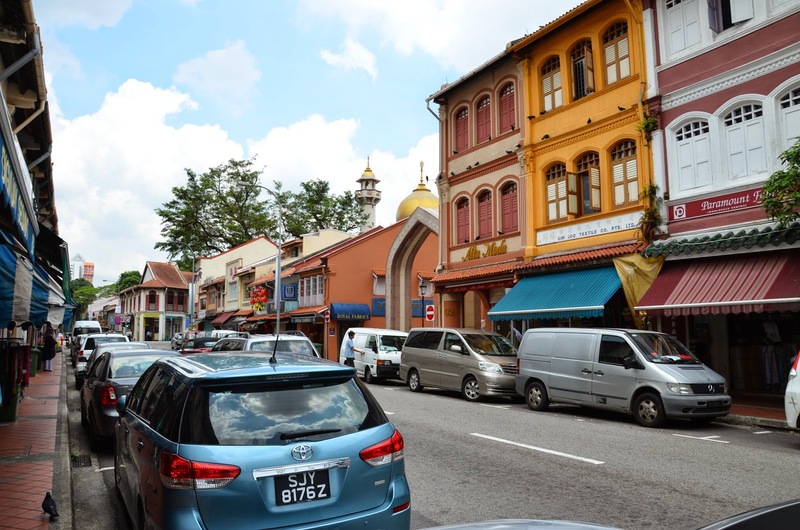 I loved Arab Street and Little India. Thanks for the fun shopping trip! I'd love to go to Singapore but it seems so expensive. Maybe you have some tips to visit more cheaply? I look forward to your posts about your trips to Singapore. Thanks for sharing! That fabric looks incredible! And I love the family bike. 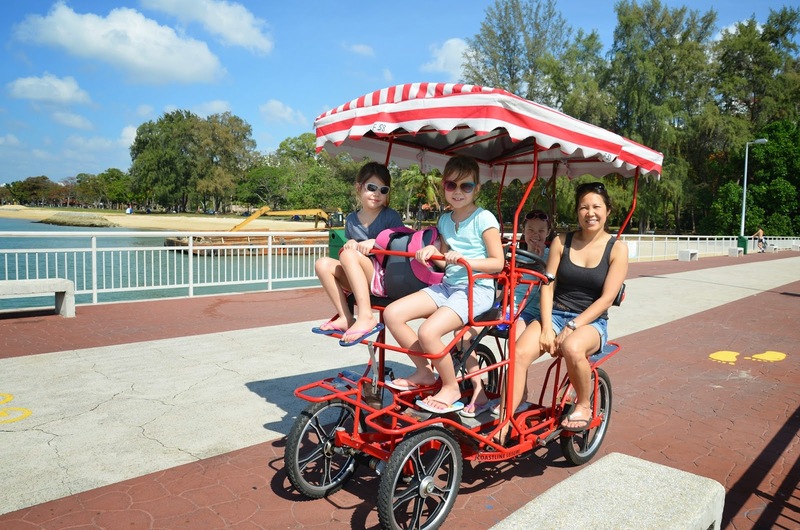 I have a bike here that has a wooden seat that Lily and Anna can ride in, and we use it to get to and from preschool. I would adore a family size version! For the motor type parts... Check out pitsco.com. fairly cheap motors ($2-$5) and other parts and kits. Some more reasonably priced than others. I've also ordered plastic gears from mcmaster.com ... Be warned, the paper catalog for that store is about four inches thick. It's like a Lego parts store but for real things! I really enjoyed reading this dear friend. What a fun adventure for all of you. Love seeing your travel photos! Dear LiEr, Thanks again for the excellent travelogue - for sharing your wonderful variety of experiences. The family bike (your girls have all stretched up in the past year! 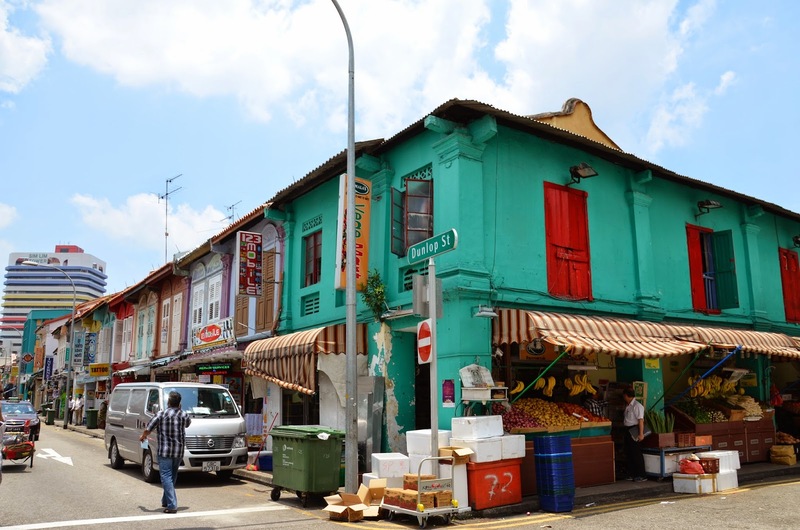 ), the delightful buildings in the historically ethnic areas of Singapore, the eclectic assortment of wares for sale - what fun to go on this adventure through you! You are generous to share it with your readers. We are grateful. And, saree pairs with blouse, which is also called a choli sometimes though choli is used more with lehengas... Was this the missing word? Choli! Yes, Swati, that was the word. Thank you! 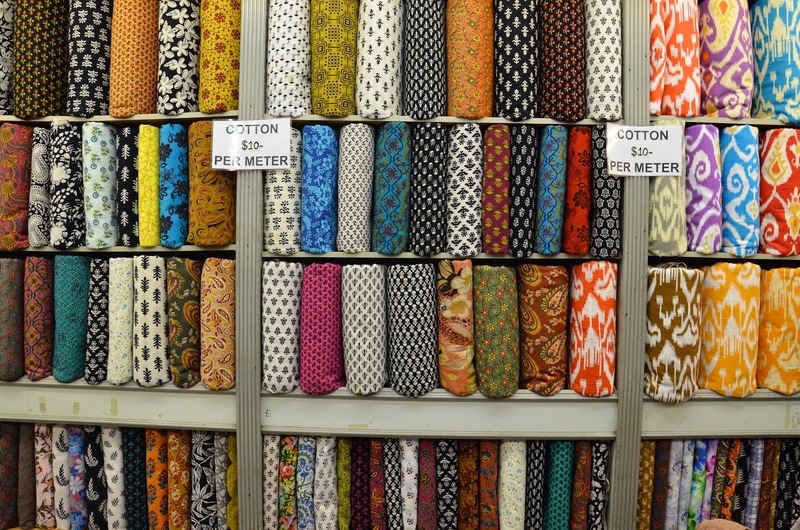 I would be very happy shopping for fabric like you do when you go home. Now you introduce the electronic mega store. WOW. I love all things creative, sewing, painting, wood working etc. BUT I also love science. I'm not a "super intelligent" physics person like you but I do have a BS in Biology and have taken physics classes amongst all my othere required courses. 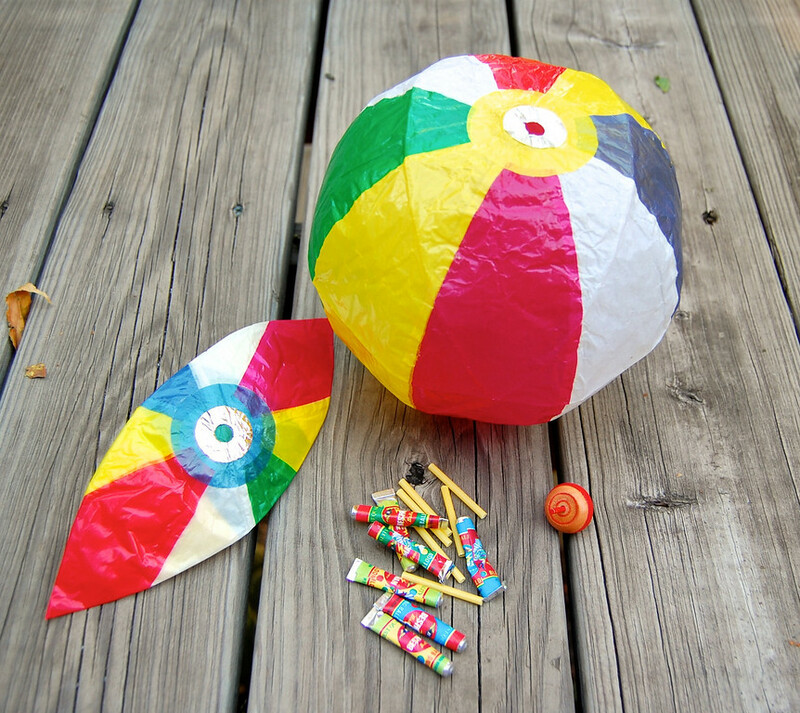 I homeschool my 3 kiddos ( now 2, 1 graduated ) and I too scoff at some of the kits I see for doing things. I love a hardware store as much as a fabric or art store. I buy things a la carte to create many things for science from our little local hardware store. 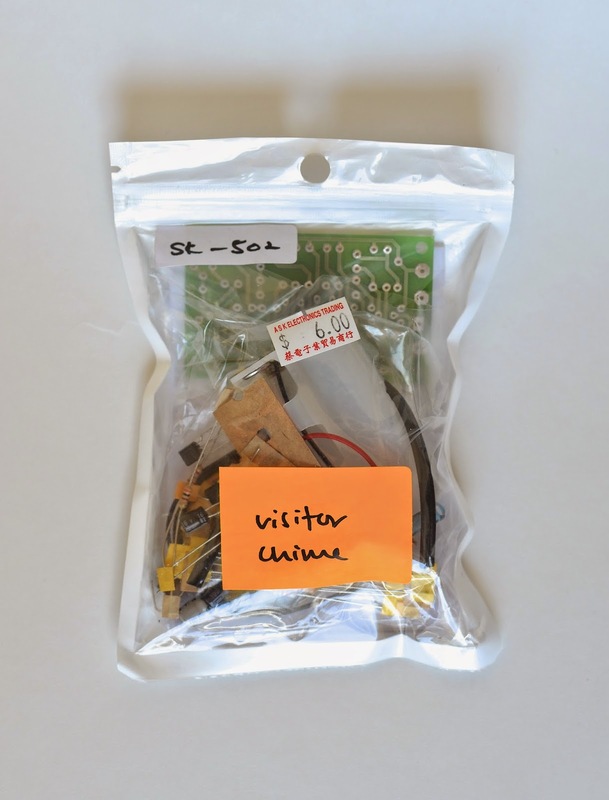 So now I have added electronic bits to my "Singapore trip lust". It's not just about fabric anymore. :) I'm being silly, but seriously all of the shopping would be worth going home for, Grandma and Grandpa are the icing on the cake! Smiggle! Instantly recongnisable in your photo by the colour coding. My girls were thrilled when one opened up locally. We love it! 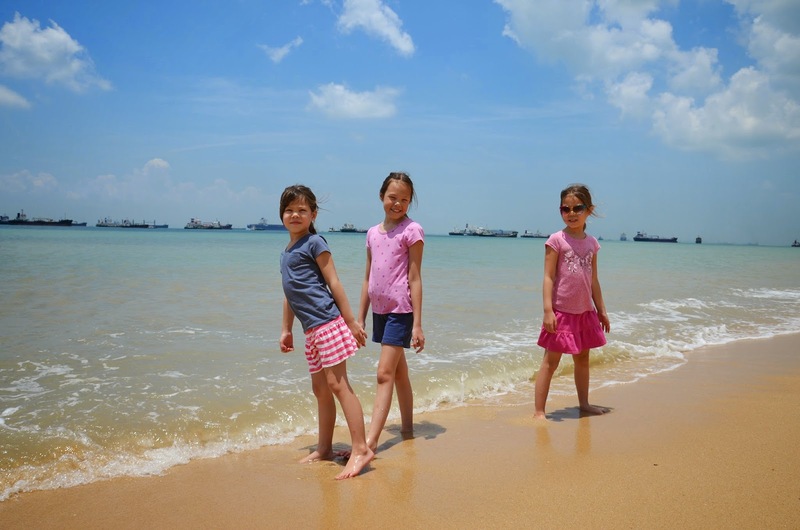 I'm catching up on blogs and had saved your Singapore posts as a treat. WOW. Those shops! 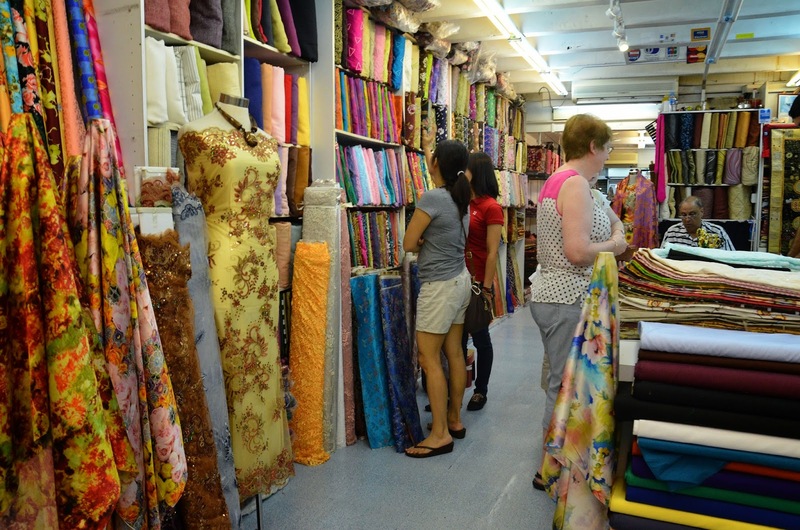 I don't generally enjoy shopping, but those fabric shops especially are mind-blowing. How do you ever choose??? Hi! 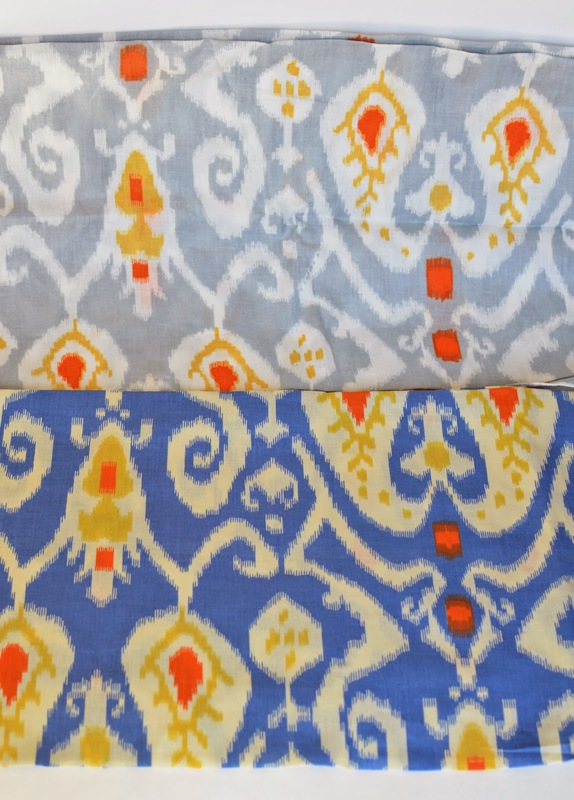 Love the photo of the faux ikat print. Dya mind telling me the name of the shop? I'd like to get some! Rubiyanti: I'm sorry I don't remember it! But it's the only shop on Arab Street that has the ikat print. And the fabric is close to the door of the store, so you'll be able to see it as you walk past. Hi, do you have the name of the shop selling all those beautiful light fixtures? B. Arafia, unfortunately, I don't. I'm sorry!